They may still be miles away from here, but you can now sense an exuberant vibe coming this way…They are a bunch of seasoned artists who got mad skills to play deliciously funky music that is said to induce non-stop dancing. Not quite veterans yet, but they are ready for the picking; they're RIPE! 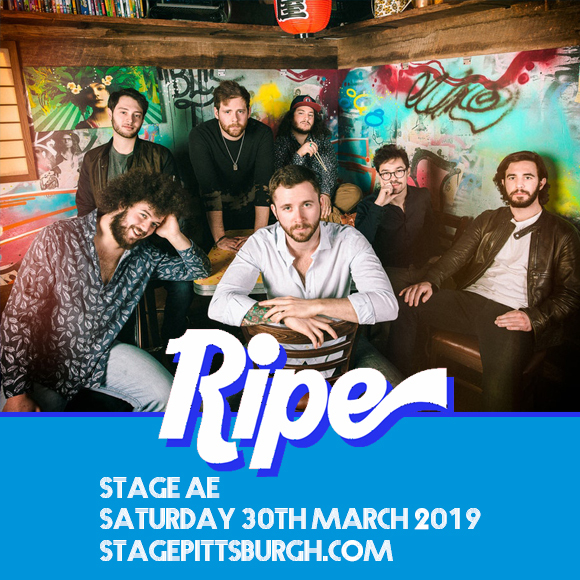 This seven-piece ensemble is getting fans all giddy for their up and coming gig right here at the Stage AE on Saturday. 30th March 2019. But before you put on those dancing shoes, make sure your feet move.. rather, your fingers quickly hit that 'buy tickets' button to make sure you've got your own little space to jump up and down on within this massive dance floor. Get your tickets now! 2016 was the banner year for Ripe, when these Berklee College of Music students started performing at festivals like High Sierra and SummerCamp and even went on the road as support for G. Love & Special Sauce. “Most of the band grew up going to festivals as spectators, so to be able to contribute to that from the artist spot is truly something I’ve been waiting to do for as long as I can remember. Especially at High Sierra where everyone’s at equal playing field, you could go to the area backstage if you want…Guys that I have been listening to, as long as, if not longer than we’ve been a band. We’re finally able to give back to people that like that kind of sound with the thing that we do, and it means so much to me,” explains frontman Robbie Wulfsohn. Ripe offers a burst of flavors to their sound. Take a bite and you'll taste a kick of jam band, a fizz funk, an aroma of jazz and an aftertaste of soul. “I want to appeal to Phish fans, and to D’Angelo fans,” says Robbie. When asked about the band’s genre, however, it’s all “dance music” at the end of the day. And with all that, they give fans a jolt of energy and keep the fun, funky groove frequency going on from start to finish. Get on the move now, as Ripe fans are wasting no time getting tickets to this super fun event. Your turn. Grab your ticket now!